I love them because you can cook up a whole bunch and then you can flash freeze for later!! Then on those busy mornings you can simply pop them into the toaster or oven on a cookie sheet and BOOM, not work at all! With Valentines right around the corner, this is a perfect breakfast! Super easy but oh so delicious! Remember you can actually make ahead and freeze. 4 Here are more deelish Breakfast ideas your family might love! Mix together eggs and milk in a shallow bowl, if you have one. ( this just makes it easier for dipping the bread ) Add Vanilla and mix together. 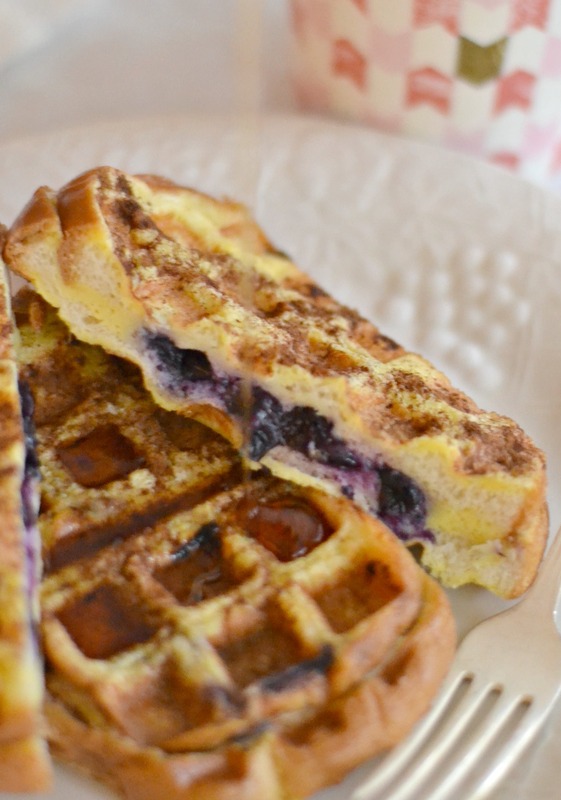 To make the BEST French Toast and for these Blueberry French Toast Waffles, DO NOT SOAK BREAD! 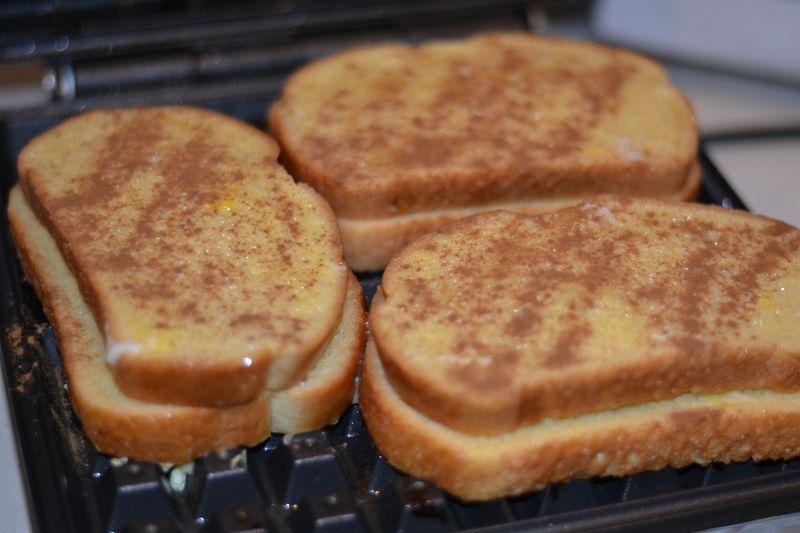 This is the key to perfect French Toast. Dip quickly on both sides and remove immediately and place on the Waffle Iron. Be sure you spray your waffle iron with cooking spray. 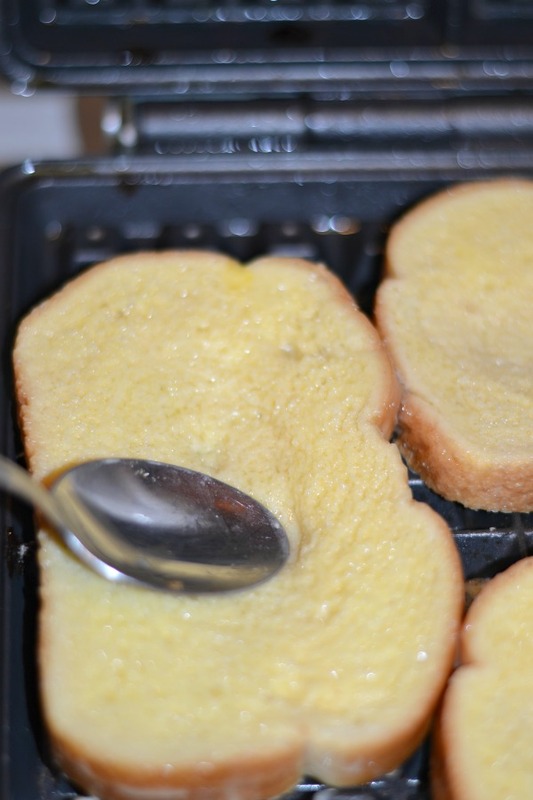 Once you’ve placed your pieces of egg dipped bread onto the waffle iron, gently use the back of the spoon (as seen above) to create a little dent in the middle of the bread. Then place Blueberries into the center. You can use Frozen (that’s what I used, as I have 12 pounds left to use up!) Or fresh! Then place another piece of egg dipped bread on top of the blueberries. Sprinkle with Cinnamon if you like! Now close up your waffle iron and cook. Each waffle iron is different so cooking time may vary. Mine takes about 3 mins. Don’t open your waffle iron until the signal tells you to. Otherwise you have sticking. Once your signal goes off, GENTLY open your waffle iron. See if your Blueberry Stuffed French Toast Waffles look golden on the edges. Sprinkle with Powdered Sugar for a little extra beauty and flavor. Or simply add syrup! 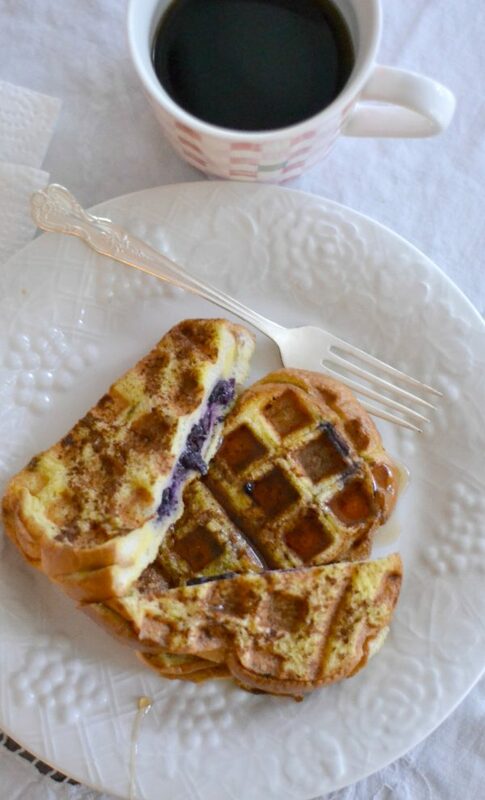 These easy unique Blueberry Stuffed French toast waffles are simply heavenly! With a touch of Vanilla and Cinnamon these are the Best you'll ever taste! You can also make a ton of them and freeze for later! 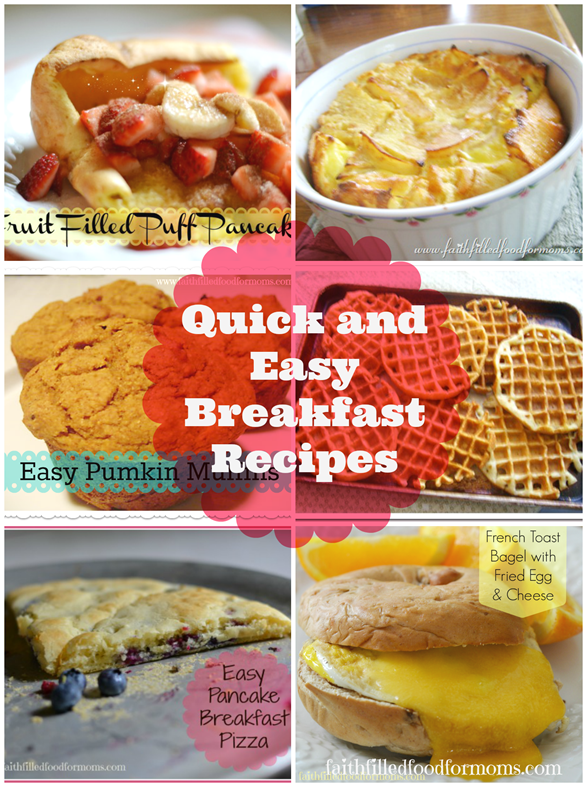 Here are more deelish Breakfast ideas your family might love! « 100 Free Fitness Apps to Keep You Inspired and Motivated! Hey Shari…! 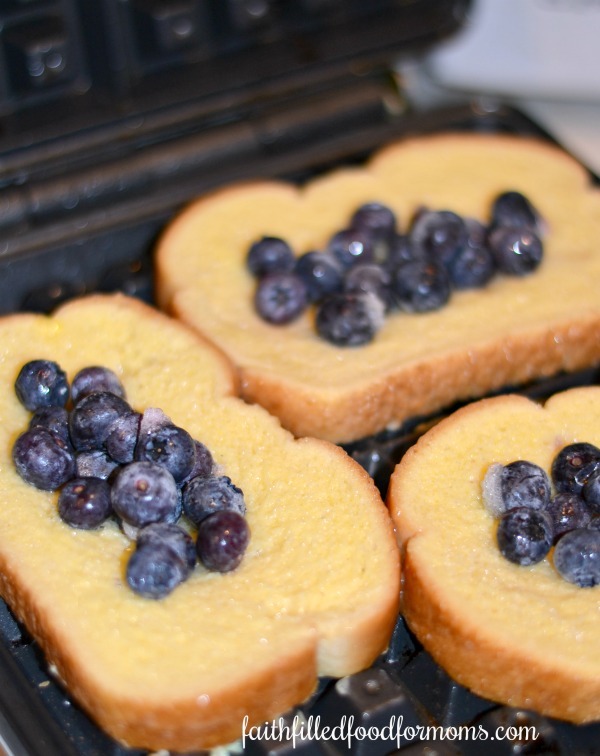 I love toast and your heavenly blueberry stuffed toast…looks sooo good & yummy, I will definitely making these in few days later, this is the best toast for good breakfast. Thanks for sharing….! You are welcome Samantha! Enjoy! !